When planning to update your garden paving, there are a whole host of different materials, textures, styles and colours to choose from. Of course, there’s also the cost to consider as well, along with which paving options are suitable for your own budget. Many traditional types of paving – which can sometimes be a tad on the more expensive side – now come with a more affordable version of themselves, that typically share the same style or appearance. This can be said for York Stone paving, a very popular choice amongst homeowners but can sometimes be a little stretching on the cost front. For those of you who are fans of the York Stone appearance but have a stricter budget that won’t allow for the cost of this paving, you’ll be pleased to hear that the Raj Green paving is a fantastic alternative that we’re sure you will love. Find out more about York Stone and Raj Green paving, including their similarities and what makes Raj Green a fantastic choice for homeowners on more of a budget. York Stone, or Yorkstone as some know it, has been a favourite paving stone choice for many years, around 200 years to be precise! It is a natural stone, sourced from quarries within the north Yorkshire moors, and typically consists of either yellow-brown (buff) or grey shades. It’s this subtle yet attractive style that makes this stone very popular amongst UK homeowners, as it blends seamlessly into any and all surroundings. York Stone is very versatile and, as such, can be used in both large and small areas where paving is required. It is extremely durable and once it is installed in your own garden, you can expect it to last you many years. In fact, you probably won’t have to consider replacing your paving once you have York Stone fitted. Thanks to the modern cutting techniques of today, York Stone is now available in a variety of shapes and sizes, so you’re bound to find a style of this paving to meet your own requirements. Raj Green is another popular paving choice for homeowners across the country. 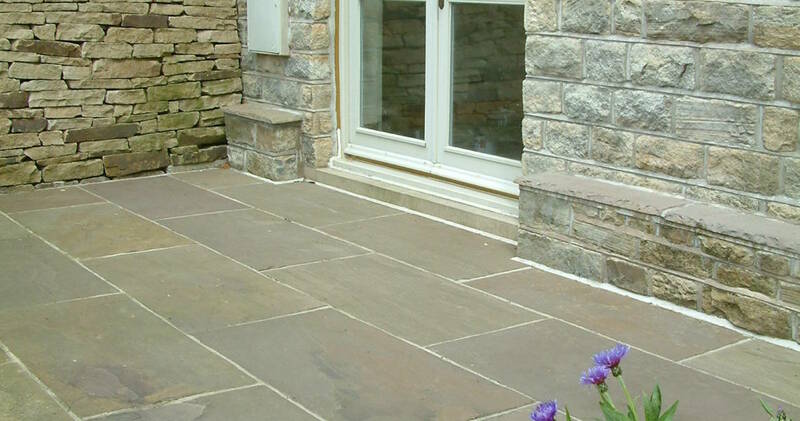 Similarly to York Stone, it is a natural stone (sandstone), however this particular paving choice is sourced from the northwest region of India. Raj Green is available in a variety of shades, from greens and plums, to greys and browns, the latter of which are very similar to the York Stone tones. Even though this particular stone is sourced from another continent, you’ll be pleased to hear that its subtle and complementing shades will blend in perfectly with your garden landscape. Both of the two stones have a natural riven texture to them, which adds plenty of character and a pleasing appearance to any garden, pathway or driveway – however you are choosing to use the stone on your property. Raj Green became extremely popular in the UK when it first arrived on the market, due to its appearance being very similar to that of York Stone. What’s more, is that Raj Green is much more affordable than the traditional York Stone, which makes it even more popular amongst homeowners with more of a budget to stick to. Even with the lower cost, Raj Green is extremely durable and versatile, and can be expected to last for many, many years once installed into your outdoor area. With good care and consideration, both types of stone will not need replacing once they have been fitted. Thanks to Raj Green, homeowners of all budgets are able to invest in a high quality and aesthetically pleasing paving that pairs well with any garden landscape. Whether you opt for Raj Green or York Stone, you can be rest assured your lovely new paving will last you a lifetime.